Brighton & Hove is a vibrant and flourishing space currently hidden under a sea of construction. But behind the building blocks and cranes are lots of exciting new attractions ready to transform the city. We’ve compiled a list of all the hottest developments in 2019 to get excited about. 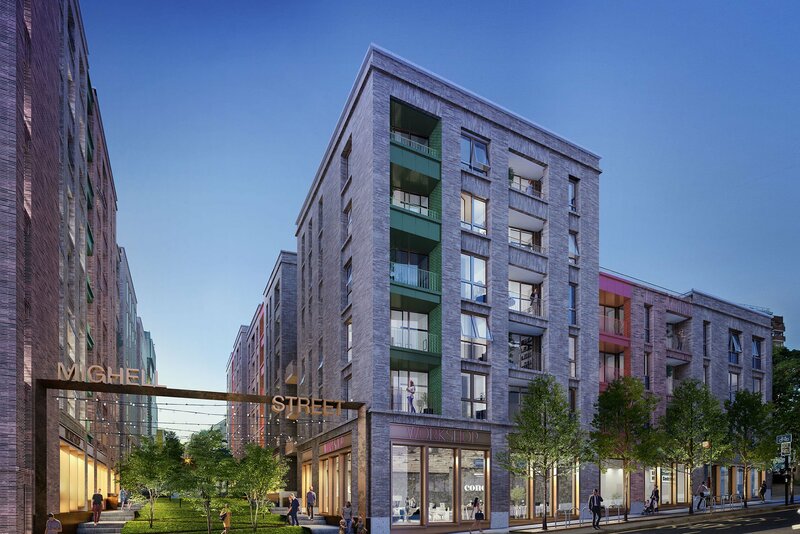 The site with the old AMEX House, once nicknamed ‘The Wedding Cake’, has been demolished to make way for a new redevelopment, after £120 million of funding was granted to developers First Base and Patron Capital to create a new and innovative Edward Street Quarter. The scheme, now approved by BHCC, plans to create 160,000ft2 of creative office space and 168 affordable homes for locals. The redevelopment will also open doors for retailers and restaurants that could bring 2,000 jobs to the city. The project, designed by Buckley Gray Yeoman, aims to reflect Brighton’s vibrant and environmentally friendly street scene, adding 130 new trees and 45 plant species in three new public spaces created by the eminent landscape designers Spacehub. Delivering: 160,000 sq ft of office space, 168 homes, retail, restaurants projected to bring in 2000 jobs to the city. Lined with cobbled pavements and narrow streets of funky shops, the lanes lie at the centre of Brighton’s most popular landmarks. As integral parts of the iconic heritage of the city they have been in need of regeneration for quite some time. In 2017, the European retail real estate investment manager Redevco, planned to redevelop the 1.3-acre site into a modern retail and leisure destination in efforts to draw more tourists to the new area. The £72 million project originally estimated to be completed by mid-2018 is now set to be finished in early 2019. The Hanningtons Estate development could be the revitalising makeover our renowned Lanes need. 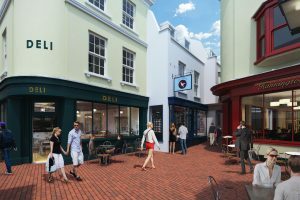 Expect to see new retailers and quirky cafes appearing in their numbers as the plan to create bundles of space of innovation has just been approved by Brighton & Hove Council. One business we can look forward to seeing is restaurant Flint House, the newest addition to Brighton’s popular Gingerman Group chain. You can’t help but get excited for the critically acclaimed food and drink which future tourists can tuck into as they admire the beautiful architecture of the new building, set to be in the centre of the Estate. “We couldn’t have asked for a better restaurant operator to occupy the jewel in the crown of this scheme.” Andrew Foulds, portfolio director at developers Redevco released in a statement. The chain established in 1998, presently has four successful restaurants – including The Ginger Pig which was ranked by GQ as one of the best pubs in the UK! As the redevelopment is well under way, look forward to fresh injections of colour and vibrance into the city, as the design of Hanningtons Estate aims to turn Brighton’s historical cobbles into a contemporary space that reflects the new generation, without forgetting the importance of the old heritage. 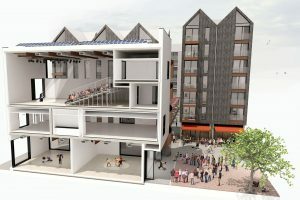 The street formerly home to a derelict fruit and vegetable market in Brighton’s centre is set to be transformed into a new public square packed full of new retail business, leisure activities and creative spaces for you to enjoy. Regeneration of Circus Street has been in the works since 2017, and developer U+I is aiming to completely transform this tired old public space into an area which they hope will reflect Brighton’s vibrant and artistic community. Brighton & Hove City Council secured a whopping £130 million to aid the project anticipated to bring some of the best creative communities together such as artists, dance groups and a handful of innovative companies. These essential parts of Brighton’s diverse society may turn this neglected area into a place tourists don’t want to miss out on! The redevelopment aims to create over 400 jobs in the next ten years, injecting an estimated £200 million into the local economy as a result and this isn’t the only advantage of the renovation! Brighton’s dense student population will benefit as a new accommodation complex with 450 student bedrooms will put them right in the centre of the city, a perfect distance from the nightlife scene and cheeky burger restaurants for 3am meals. There will also be 30,000 square feet of new office space for small businesses to grow and thrive. Let’s not forget the design plan of this development though, as architects Shedkm and TP Bennett have crafted modern and contemporary structure designs, which will make the area look like a futuristic band of colour compared to the gloomy streets we currently see. Building works are currently underway on the site and we are excited to see it completed by the end of 2019. Delivering: 142 new homes, 450 student bedrooms, new office space, South East Dance studio, artist spaces, performance spaces. Brighton’s seafront holds the heart of the city. From the famous Brighton Palace Pier that looks out onto the ocean to the string of restaurants, shops and clubbing scene along the promenade, it shines in all its glory on a sunny day. The Shelter Hall once stood in pride of place, completing the tourist attraction with its Victorian styled architecture. As the city’s popularity is only growing, Brighton & Hove City Council decided to reconstruct the West Street Shelter Hall in 2015, in order to create a new contemporary scene future tourists can admire whilst munching on their fish and chips. Design plans for the new Shelter Hall reveal that the redevelopment will be a larger version of the old building, which dates all the way back to the 1880’s. The historical architecture won’t be forgotten though, as the £19 million project aims to inject some modernity into a new 21st century commercial location situated just a short walk away from the popular I360. So don’t forget to look up at its brand new features such as the rotunda on top and a picture worthy roof terrace. This development is also vital in order to save the seafront road A259, from collapsing in the future. Counsellor Gill Mitchell, chair of the council’s Environment Transport and Sustainability Committee said: “Following two years of extensive and complex engineering work to strengthen the seafront road and stabilise the ground, it’s exciting to see the new Shelter Hall taking shape. 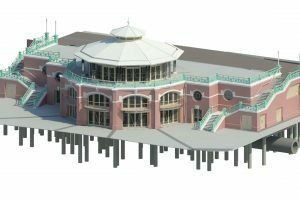 The Shelter Hall project is the first part of the council’s investment scheme to regenerate the seafront infrastructure which is planned to be completely restored in the coming years. Unfortunately, those ‘pretty’ construction boards will remain up along the seafront for a few months yet but when they come down in Autumn 2019 we are sure they’ll reveal something wonderful!